It is a pageant held as a fundraiser for the San Pedro Pre School, and this year, four little beauties went onstage in the hopes of capturing the tiara and title of Miss Chiquitita. At 8PM on Saturday May 4th, the pageant kicked off with a dance number that introduced each of the girls: Zillah Flota, Seydi Francela, Destiney Gonzalez and Emy Segovia. The crowd that gathered at the Central Park was enthusiastic in their applause and encouragement of each child, and it was apparent that the five judges would have a hard time handing down their decision. Felix Ayuso, Yakarelis Hernandez, LilianaNuñez, Caitlyn Stolley and Marivel Gomez were tasked with judging the girls on their poise, talent and overall charm and performance on stage. Melly Badillo and Dalinda Guerrero were the tabulators for the evening. As the introduction/dance finished, each girl left the stage to prepare for their talent segment, so Rompe Raja band struck up a few lively tunes during the interim, while attendees picked up some snacks and drinks at the food and drink booths. Zillah was up first with her well-prepared skit, “I love San Pedro”, and it featured a variety of costumes and dances depicting various fun activities throughout the year. 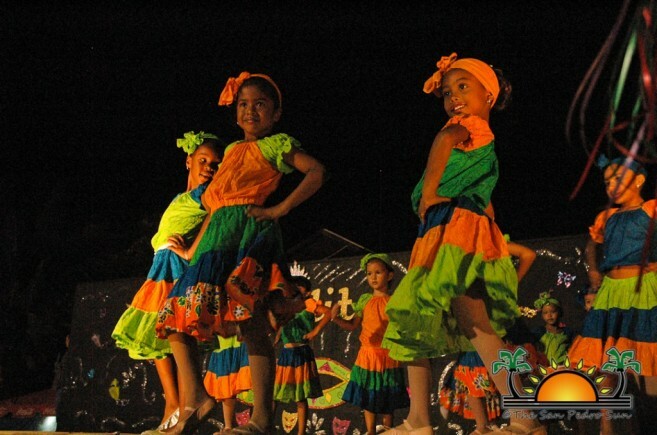 From Dia de San Pedro, to Lobsterfest to Carnaval, it was a colorful and brilliant performance. Following that act was Seydi Francela, whose dance delighted the audience. Also dancing a fun musical mix was Destiney Gonzalez, who came out in a fabulously colorful costume and commanded the stage. Singing to Adele’s “Rolling in the Deep” was the enormously talented Emy Segovia, whose great vocals commanded some seriously tough notes – we have a new singer in town! Talent certainly abounded onstage, and judges could be seen furiously scribbling notes as each performance ended.Giving each girl time to change into their gorgeous evening gowns, the San Pedro Dance Academy got onstage to dance a few numbers in cute outfits and with much enthusiasm. Their performance alternated with Neslen Rivero, who sang a few beautiful songs during the interim. Then it was time for the little princesses to walk the stage in their stunning gowns which ranged in color from lilac, to rose, to purple and pink. With faces hidden by glittering masks, each little girl slowly walked the stage, removing their masks to smile and wave to the applauding crowd. It was their final walk on stage before the judges made their decision. Outgoing Miss Chiquitita Kiryani Pou gave her final walk on stage, before the four contestants came back out to face the crowd and hear the announcement of the winner. There was a variety of special prizes announced before: Miss Amity was the enthusiastic and smiling Destiney Gonzalez, Most Photogenic was Seidy Francela, while Best Hair went to Emy Segovia. Then, to the sound of the drumrolls, MC Eiden Salazar Jr. announced the winner: Zillah Flota! Congratulations to all four lovely contestants – you all did a wonderful job!! To the winner Zillah, may your year’s reign as Miss Chiquitita be lots of fun – well done! Organizers of the event would like to thank their sponsors: Caye Supplies, Warpaint, A&R, Coral Cable Vision, Caramba Restaurant, Manelly’s, Matachica, Save On, Greenhouse, Cholo’s Golf Cart Rentals, Carts Belize, Leslie’s Salon, Wild Mango’s, Candle Garden, Ocean Essence Day Spa, Chuck & Robbie’s Dive Shop, Estel’s, Ambergris Hope Pharmacy, Dalia’s, Jambel’s Jerk Pit, Ashley’s, Divas and Dudes, Honorable Manuel Heredia Jr., San Pedro Town Council, The San Pedro Sun, Ambergris Today, Reef Radio, Moho Chocolate, Suya Tours, Susana and Mello Family, Captain Shark’s, Sajia’s Construction, Mar’s Boutique, Beauty Club, Castillo’s Hardware, Mar De Colores, Caribbean Golf Cart Rentals, Lily’s Restaurant, Ramon’s Village Resort, El Fogon, Annie’s Pastries, Moondancer, Eiden Salazar Jr. and Love Belize. Miss Chiquitita Pageant this Saturday, April 21! Miss Chiquitita 2010 - coming soon!